RoCoCo is participating in this event and will be donating work to the silent auction being held at Mercury 20 Gallery on 25th Street. For more information go HERE or to the facebook page HERE. RoCoCo is honored to be a part of this next iteration of Love Our Island Art Walk in Alameda. Join us on Park Street (between Central and Encinal) from 6-9pm on June 8, 2018. 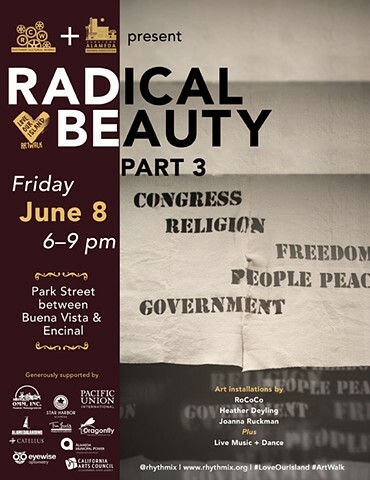 On Friday, June 8th Rhythmix Cultural Works and the Downtown Alameda Business Association will present three hours of art, dance and musical performances on Park Street. Three new art installations will be revealed in empty storefront spaces by visual artists RoCoCo (KC Rosenberg & Modesto Covarrubias), Heather Deyling, and Joanna Ruckman. Live music from Paul Manousos (Solo Acoustic), The Chinyakare Ensemble (Shona Marimba) , Trio Sin Lio (Salsa), Cava Menzies Duo (Jazz), and Steve Lucky and the Carmen Getit Show (Swing), creating a fun-filled evening for the whole family. 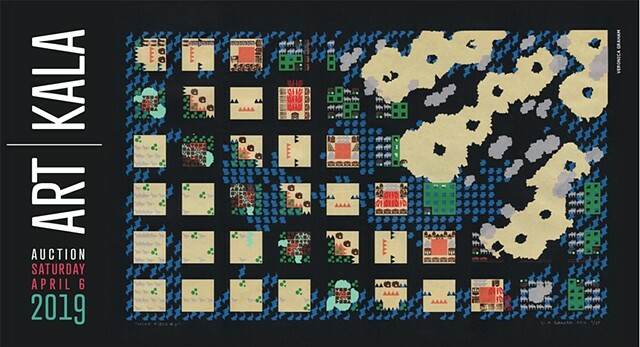 MACLA's 20th Annual Exhibition and Auction is on view April 4, 2018 to May 19, 2018. RoCoCo is proud to be participating and contributing to this exhibition and auction. Pilar Agüero-Esparza • Natalia Anciso • José Arenas • Julia Arredondo • Luis Roberto Vásquez Borja • Víctor Cartagena • Melanie Cervantes • Betty Davis • Aaron De La Cruz • Aaron Douglas Estrada • Adrian Esparza • Eric Garcia • Gronk • Nereida Garcia Ferraz • Elizabeth Gómez • Jorge González • Yolanda Guerra • Robert Jackson Harrington • Juan Felipe Herrera • Louis Jacinto • Francisco “Pancho” Jiménez • Gilbert "Magu" Luján • Scape Martinez • Gwen Mercado Reyes • Joe Bastida Rodriguez • Adriana Monsalve • Viva Paredes • Elina Peduzzi • Poesia • Benito Rangel de María • Daniella Rascón • Fernando Reyes • RoCoCo (KC Rosenberg & Modesto Covarrubias) • Carlos Rodríguez • Samuel Rodríguez • Verónica Rojas • Jessica Sabogal • Pablo Soto Campoamor • Paul Valadez • Linda Vallejo • Cristina Velásquez • and more. This popular, annual event culminates in a high energy evening with food, drinks, entertainment and friendly bidding. Here you will find art by Bay Area favorites as well as artists with national and international reputations. The work ranges from painting to drawing to photography to sculpture and jewelry. 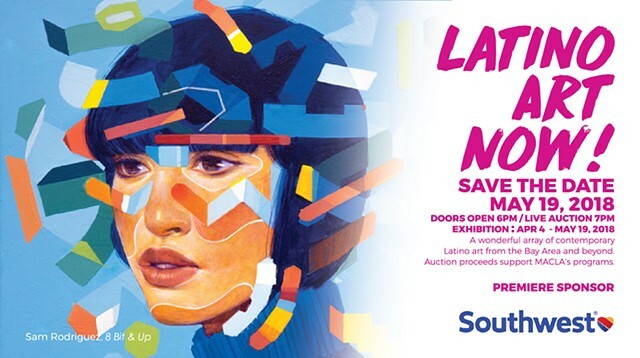 Highlights of this year's exhibition are Pilar Agüero-Esparza, Melanie Cervantes, Adrian Esparza; Bay Area favorites Aaron De La Cruz, Sam Rodriguez, and Jessica Sabogal; and notable veterans of Chicana/o art Gronk, Linda Vallejo and Gilbert "Magu" Luján. 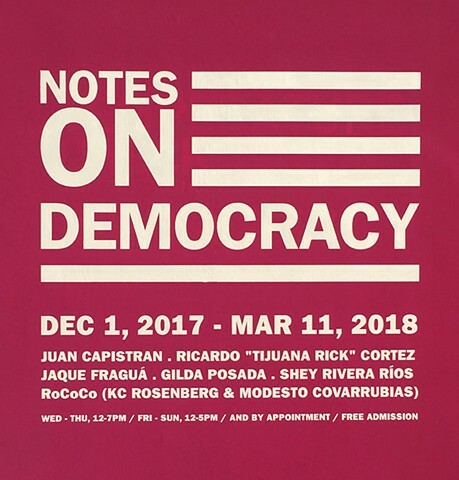 RoCoCo is proud to be included in the group exhibition "Notes On Democracy" at MACLA in San Jose, California. December 1, 2017 - March 17, 2018. RoCoCo will be the Artists in Residence at the San Jose Museum of Quilts & Textiles (SJMQT) from October through December 2017. The San Jose Museum of Quilts & Textiles' Artist in Residence program began in October 2016 with an incredible response from the local community, Museum Members, and Visitors. We host an artist or collaborative group every three months. Artists have an onsite open studio during their three month residency in our newly renovated Maker Space. Our AIR program also provides exhibition space for each artist in our Maker Space Gallery. Come on by during RoCoCo's open studio hours. We will be there on Thursdays & Fridays from 11am to 3:30pm, and on Saturdays from 11am to 2:30pm. 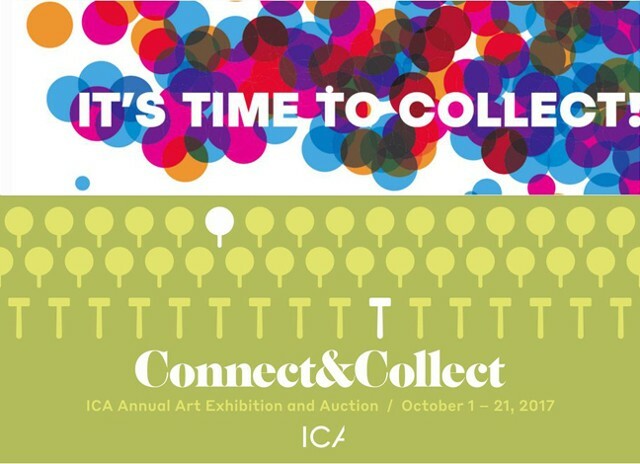 RoCoCo is proudly donating works to Berkeley Art Center and the San Jose ICA for their annual auctions. The works will also be on display as part of the exhibitions at each location. 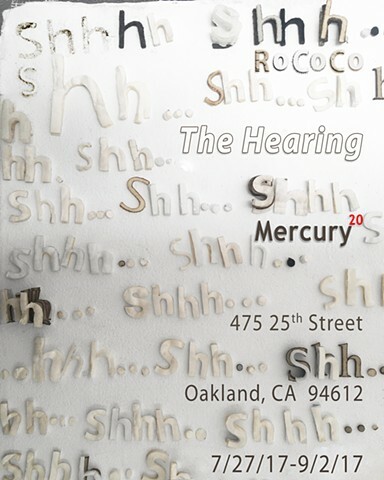 The Hearing is on view at Mercury 20 Gallery in Oakland, CA. Mercury 20 Gallery hours: Thursday - Saturday, noon - 6pm. 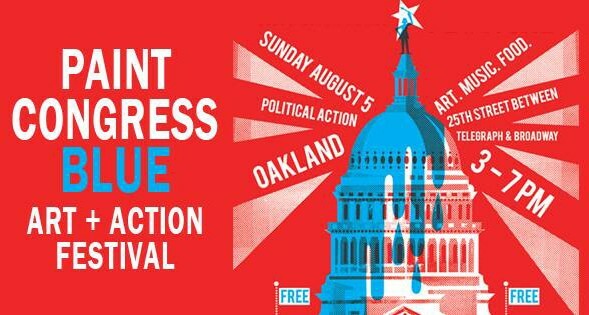 Oakland Art Murmur First Fridays: August 4 & September 1, 2017, 6 - 9pm. 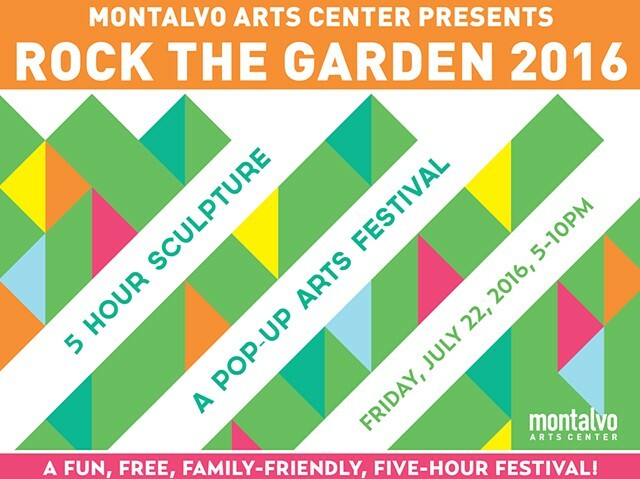 RoCoCo is excited to be participating in Montalvo Art Center's Rock the Garden Festival - 5 Hour Sculpture on Friday, July 22, 2016, from 5-10pm. As part of the artist collective Art Escapists, RoCoCo will express forgiveness on a gigantic Eucalyptus stump and engage attendees in a chance to create work based upon intentionality. Forgiveness Too is a tower of paper and textiles rising from the face of a gigantic Eucalyptus tree stump. Good Intentions & Other Paths will engage attendees to swing buckets of melting ink over large swaths of tracing paper, creating abstract works with intentional (and perhaps unintentional) markings.